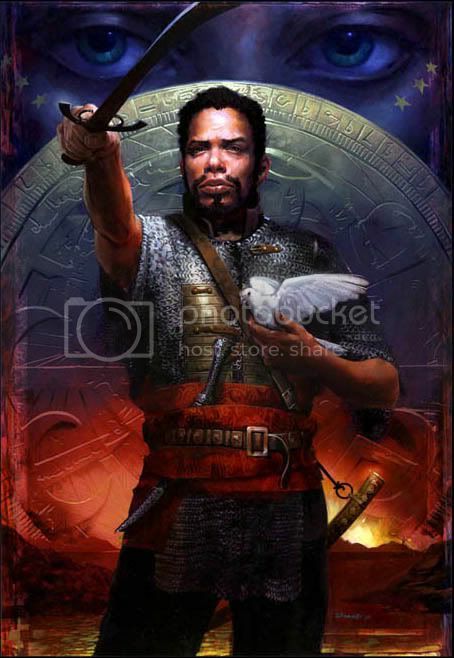 Once again, Locus Online does us the great service of exhibiting nearly every 2006 science fiction and fantasy book and magazine cover sorted by artist. For those voting on the art hugo: bookmark it, refer to it, and remember that the artists' websites are just a google away. Exposé, the art annual for digital work, has thier call for entries up here. Deadline: February 26. Start pushin' them pixels. Here is John Scalzi on the awesomeness of seeing paintings in the flesh. 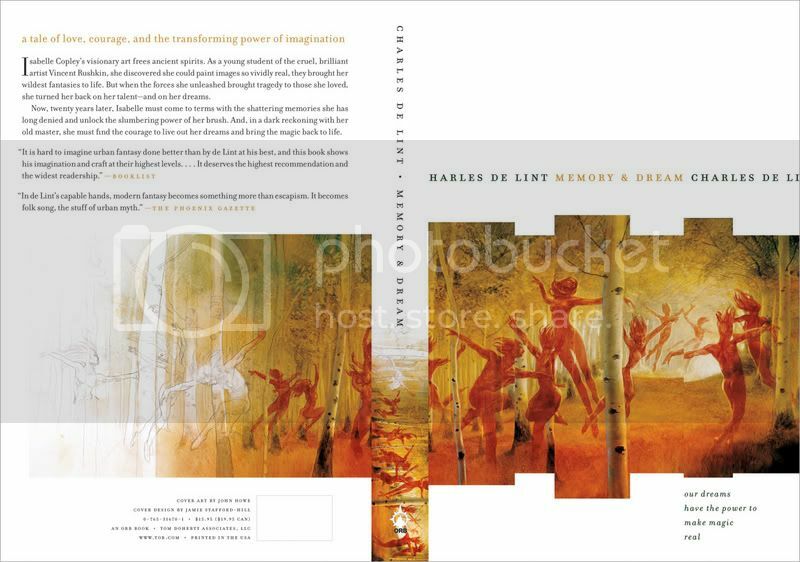 Here is another re-design of a book we've been publishing for a while, Charles de Lint's Memory and Dream. Art by John Howe. Design by Jamie-Stafford-Hill. This went to press just before the holiday break so it should be on the shelves in about a month or so. Marc Burkhardt has an interesting post about designers opting for existing art over newly commissioned art. I don't think you can underestimate the effect that education has on this issue. Design students use the resources they have available to them, which is anything they can download. They create their own imagery using bits and pieces they find off the web and it looks polished. When I see the senior shows around town I am amazed how clean and professional all the design work looks next to the illustration students' work. Painting takes time to do well, lots of time -- usually a few more years than kids are in school for. The designers aren't more talented, hard working, or smarter than the illustration students, but at a glance you might think so. Designers aren't taught, or encouraged, to work with the illustrators in school so why would it occur to them to hire an illustrator once they are out of school? Sadly, they miss the excitement that collaboration brings, the possibility that two minds working on a problem might answer it better than one, and the impact that a truly unique and tailored package can have. I go out and remember only the most rudimentary traits of the bird. Like, "That's a pretty gray and white bird." I then go back to look it up in a book and realize that there are dozens of gray and white birds that look almost exactly the same. I blame my inability to identify the bird on the book and then go out and buy another book. It's fun! Perhaps bringing along Denny, my mom's bird-hunting gordon setter, isn't the best way to spot small feathery things...but again I say, I am all about bad birding! For great shots of birds in Manhattan, I visit Bruce Yolton's site, Urban Hawks. Coincidentally, I work just a few flights beneath his office...and I still like him even though he laughed at me when I told him my (apparently pathetic) price range for new binoculars. 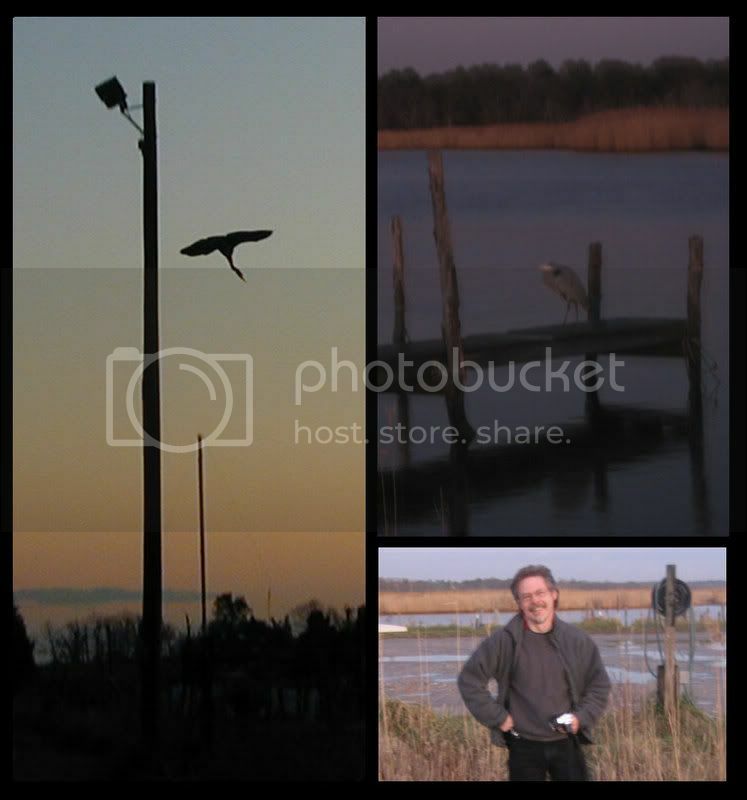 TOP: Greg and I tracking down the (not very) elusive Great Blue Heron that lives down the block. 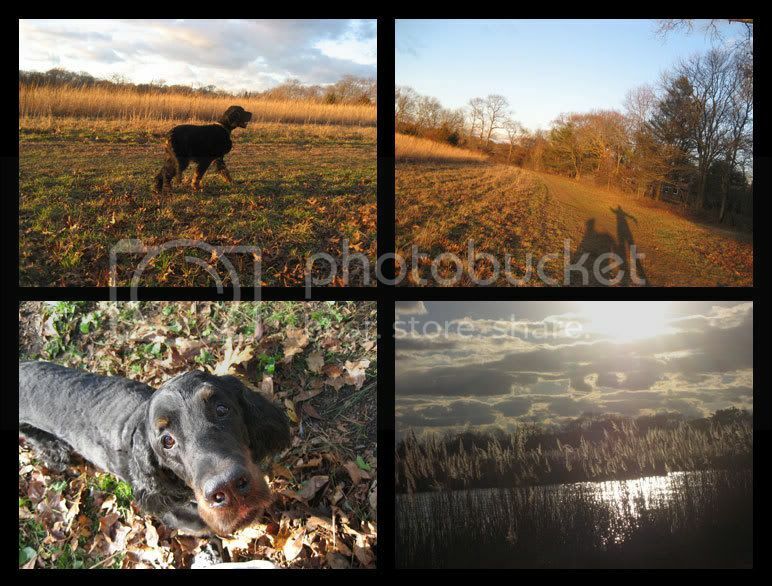 MIDDLE: Denny and I take a walk. BOTTOM: Jack, of course, appalled by anything requiring movement. 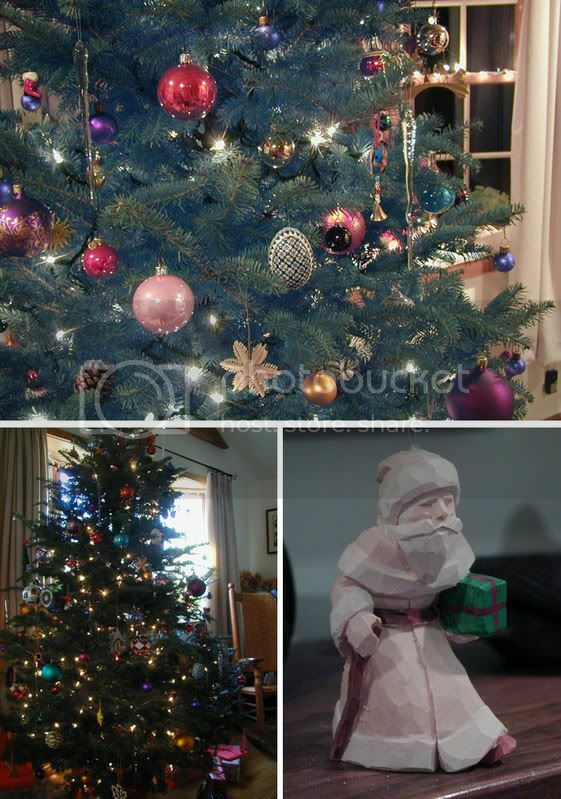 I’m sitting here between the fireplace and the christmas tree (I am slightly obsessed with christmas trees) and I don’t plan to wander more than three feet from either for a bunch of days. Happy holidays, everyone! I hope they are warm, peaceful, and full of joy. 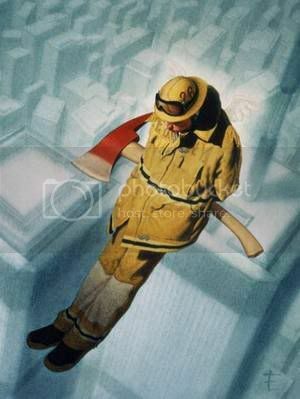 I first noticed Eric Fortune, and his remarkably sensitive paintings, when I saw his 9/11 painting in Spectrum 11. So quietly sad...understated and resolved. Seeing the original painting is even more stunning. Since then, I look forward to seeing his work wherever it appears. Favorite painting you did in the past year? Not sure. 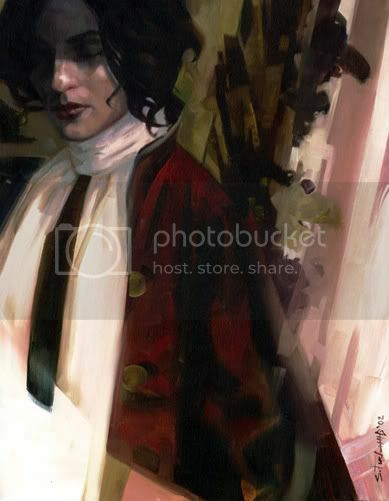 I'd have to say The Matador -- a piece that will be in the upcoming Society of Illustrators show (HIPHIP! :) or a piece titled Stephanie Shrugs recently done for Realms of Fantasy. Dream assignment would sound something like this: (In British accent) "Hello Eric, we would like to commission you to do a painting, with complete artistic freedom, of your liking. Upon completion of this work we will pay you one bazillion dollars (or euros, whatever). We will then develop a smashing blockbuster movie based around your painting and you‚ll be rich and famous and live happily ever after throughout the world, nay universe, in perpetuity". Or something like that. On a serious note, I noticed my best work is either personal or one where the art director gives you more freedom. If I enjoy painting it and it turns out well it's a dream. Do you remember the first time you knew you wanted to be an artist? I have always wanted to be an artist. However, it never seemed very practical. I thought architecture was my best bet. I could still be creative and kinda skip the whole "starving" aspect of being an artist. Senior year in high school my art teacher convinced me that I could make a living as an artist. I applied to Columbus College of Art and Design and luckily got a scholarship. Hungry as hell but I couldn't be more happy. It's a good kind of pain. I'm very happy and excited anytime I get accepted into an illustration annual. However, when I found out I made it into the very first Spectrum Exhibition I was ecstatic! Being selected from among thousands from the past eleven issues was quite an honor. And to have an original piece of art hanging next to some of my all time favorites it was outstanding. 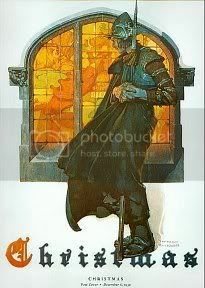 Frazetta, N.C. Wyeth, Skip Liepke, J.C. Leyedecker, Michael Whelan, John Palencar, Phil Hale, C.F. Payne to name a few. 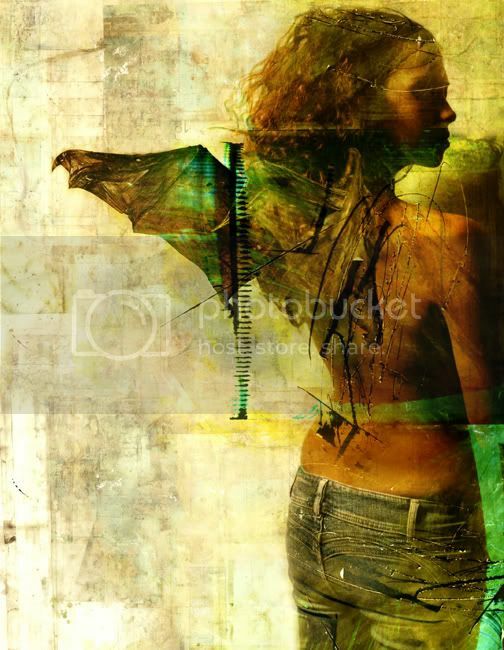 Thomas Allen, a photographer that takes old art and turns it into new art, will have an exhibit opening up in New York's Foley Gallery on January 11th. All works will be about lust and desire..
I’ve gotten a number of these in the past few weeks -- students having to do an interview with a person in their chosen field for their finals. I’ve had some good experiences and some bad ones so, here are a few "Do's and Don'ts" for you students out there. Pros and teachers, please feel free to leave information that I may have forgotten in the comments. Don’t go onto a public forum and say “Any pros out there willing to answer questions?” A cattle call will not work. Almost any illustrator/designer/art director will be flattered and/or remember what's it’s like to be a student. I can imagine only a very few being unwilling to help but you have to show that you are seeking out that person because you respect what they have to say, not just to get the assignment out of the way. State your purpose. Use a clear subject line in your email and sign off with your real name. Be professional. Save the banter and the LOLs for your friends. Your subject is taking time out of a busy schedule so stay focused on the interview. Don’t expect the interviewee to do your report for you. 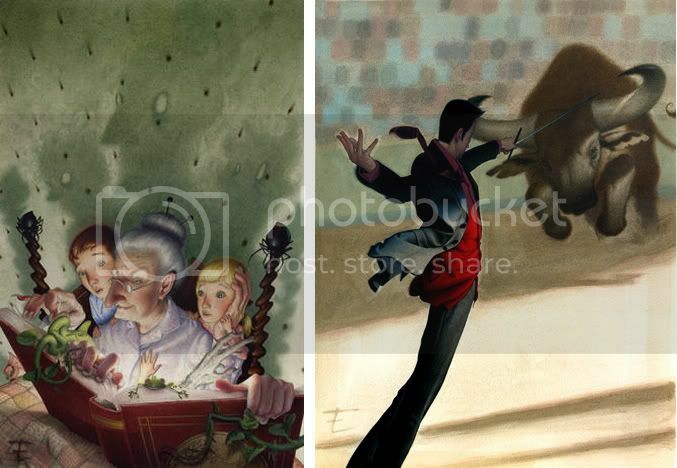 Ask specific questions -- don’t say, “Tell me about illustration?” and end it there. Artists that frequently receive these requests often put a FAQ sheet up on their websites. Go there first and see which of your questions are already answered. Show that you have done some research. I realize that the assignment is more about learning communication skills, building confidence, and starting to network than it is about the actual answers, so, once you’ve visited their websites you should acknowledge that you’ve gotten what information you could and explain that you have a few more questions. Give the interviewee the choice between a phone interview and a written interview. If they want to answer via email, give them a week to do so. If anyone else is like me, they’ll want to wait until the weekend to get to it, they’ll get distracted by the weekend’s activities, and then jump to it on Monday night. Ok, maybe that’s just me...still, give them some time. If they want a phone interview, make sure you have your questions organized and in front of you before you dial them. Try not to go quiet. Half the reason you are doing the assignment is to gain communication skills. Try to engage your subject -- you’ll get more interesting answers that way. On the other hand, if you are the type to go on, then remember to let your subject do most of the talking. They won’t want to speak over you. Always thank the person afterwards. Always! I'm subjecting myself to this public humiliation in hopes that my pride will finally kick in and make me clean up a bit. So, who here thinks I can have the place in ship-shape by New Years!? The most improbable thing I saw while Christmas shopping? 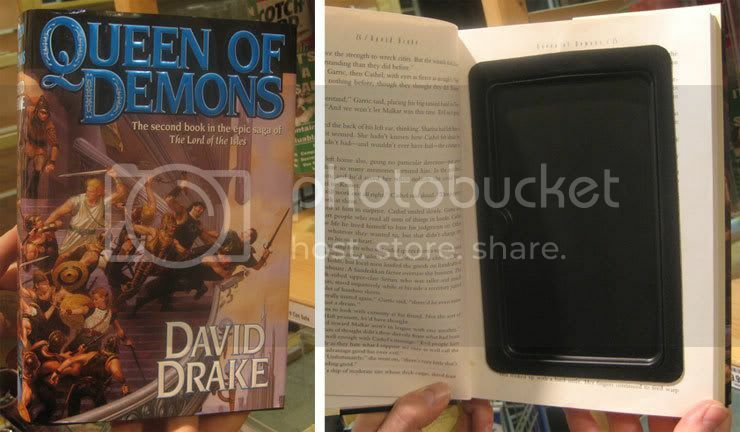 The Container Store was selling the amazing "Book Safe" made from Tor books Queen of Demons and Shadowsinger. Now tell me, where would the world be without remainders? With the release of Stephan Martiniere's second art book, QuantumScapes, I've decided to bug him with a bunch of questions. As you can see, he kinda ignored the "30 second" concept -- all the more fun for us! I am constantly amazed at how expansive his worlds are, they never seem confined to the 5x8 book cover -- truly, windows into another world. 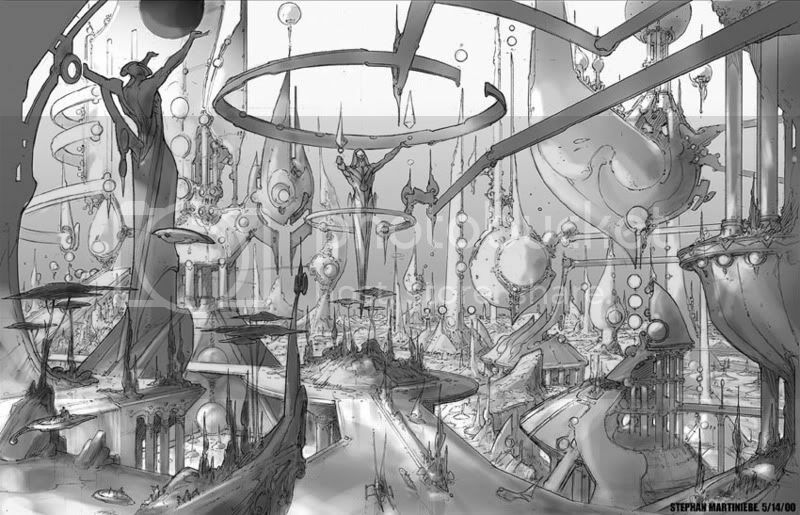 Readers here might only know Stephan for his covers but you'll do yourself a favor if you spend some time looking at his character studies, background environments, and other concept art. I would say Betrayal in Winter [seen on top left] and Variable Star. I wanted to explore something more painterly for Betrayl in Winter and explore more of the impressionistic/suggestive touches for Variable Star. There is actually a break down process in my new art book , Quantumscapes, that shows how I was playing with the suggestive ad graphic approach. Very young, that's for sure. I can't remember exactly when but I grew up in France where comic books are everywhere. I was constantly bombarded with every style imaginable, from France but also from many other countries. I knew early on that I wanted to be a comic book artist but I never thought this could lead me to film, animation or book cover. Do you have to like the book to be excited about the project? Not really. I always like a great story but a great story doesn't necessarily mean it has great visual ideas and vice versa. What painting do you wish you painted? It's a long list. Everything from Leyendecker, Cornwell, Mucha, Ferris, Bouguereau, Latour, Manet, the list goes on. This is when I get really humbled. There are so many great painters and illustrators that have inspired me and still do on a daily bases. One day I am in awe, the next day I am pumped, eventually I break all my pencils in frustration and think about trashing my computer. I am joking of course, a little. All this great art from so many masters certainly keeps me on my toes. First break in the business? In animation which eventually launched my career, "Inspector Gadget"
Most embarrassing illustration related moment? I was about 20 years old, still a rookie in the business, naive and full of confidence. I was working on the development for an animated project called "Captain Crunch" from the cereal. I had designed a very whimsical dirigible for the character and I was very proud of the result. I was asked to bring that drawing to a presentation the president of our company was going to make to our producers, directors and marketing staff. As we all sat around the conference table, the president went into a very animated and passionate sales pitch, he then grabbed the drawing of the dirigible, looked at it and says "This is very cool, Stephan, why don't you explain the idea to the team" he then held it in front of the team to see. He had been looking at the drawing upside down and didn't seem to realize it. I felt embarrassed and somehow I didn't feel that embarrassing the president as well would get me points. I thought my best option would be to go along and convinced the audience that an upside down dirigible was a very cool idea indeed. I am forever grateful that nobody pointed out the obvious. Several highlights actually. One of them was directing the five animated specials "Madeline" The first show specially. Until that show I had been directing cartoons for a few years. Most of the time the series I worked on had very limited budget and where exercises in compromises and politics. It was always difficult to achieve quality. "Madeline" was a small project. It had a very small team and the budget was decent. I had the pleasure to wear many hats on that project. I created the look, designed the characters and environments, participated in the story, art directed as well as directed and even lent my voice to some of the characters. It was really the first time I was able to realize a vision and direct without all the battles and the politics associated with bigger project. The show ended up a success and received numerous awards. Directing "Madeline" was also decisive in my career. It forced me to reevaluate myself as an artist. In this business it is seldom that one is given this kind of opportunity to work on something really meaningful and rewarding. It was likely that my next animated project would end up being another political battle with mediocre results. I decided to shift gears and go back to design. I went to work for a theme park company as a concept artist. It's always amazing to realize how small things sometimes can have a huge impact in your life. Another highlight was working with Bernie Wrightson. I am a huge fan. Bernie was one of my first influences. 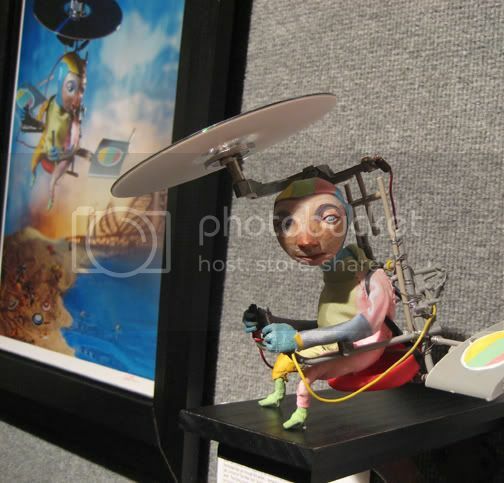 We worked together on the 3D animated feature "Gulliver's Travels" in Canada. Although we didn't work very long together I kept some fond memories of that time. The project was eventually cancelled. A more recent highlight was receiving the Exposé Grand Master Award. What is particularly rewarding is to sit next to two great artists and friends who received the Grand Master Award before me. Craig Mullins who has been very influential in my digital career and with whom I worked with on the 3D motion ride "Star Trek, the Experience" in Las Vegas and Ryan Church with whom I had the great pleasure to work with on the last two "Star Wars". I am currently the Creative Visual Director at Midway Games in Chicago working primarily on the company's fist Next-Gen game "Stranglehold" the project is the game sequel to "Hard-Boiled" the cult movie directed by John Woo. My role is very comprehensive. I was hired to create a look for the game and shepherd that vision through the production pipeline. It's a little bit like being a director and production designer at the same time. Aside from doing concepts I also supervise a team of artists and work very closely with various leads. I also do storyboards and work closely with the cinematic team. This game is being made using a new technology. Its frustrating at times but also very challenging. Bernie Wrightson, John Buscema, Chris Foss, Moebius, Otto Wagner. Bob Eggleton embarks on a painting-a-day project and a blog. As Bob would say, kewl! "The fun part of doing these paintings quickly is that it teaches you to be observant, and timing them to an hour or less, you get what you get and don't get too picky or fussy." 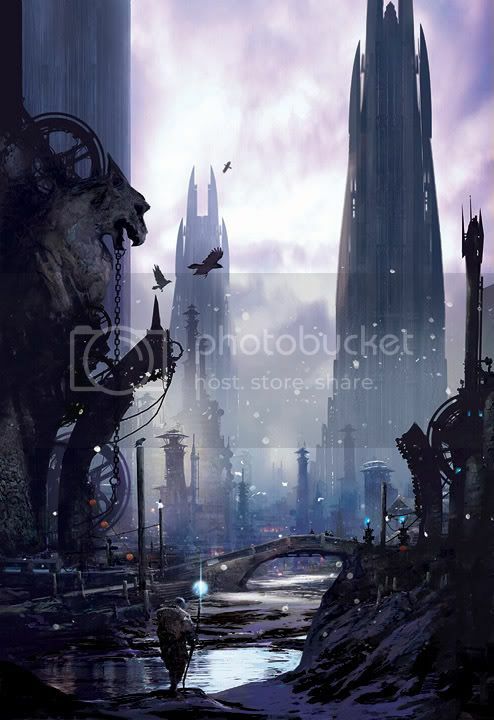 Stephan Martiniere's Quantumscapes is now available. Yay! I just ordered my copy. 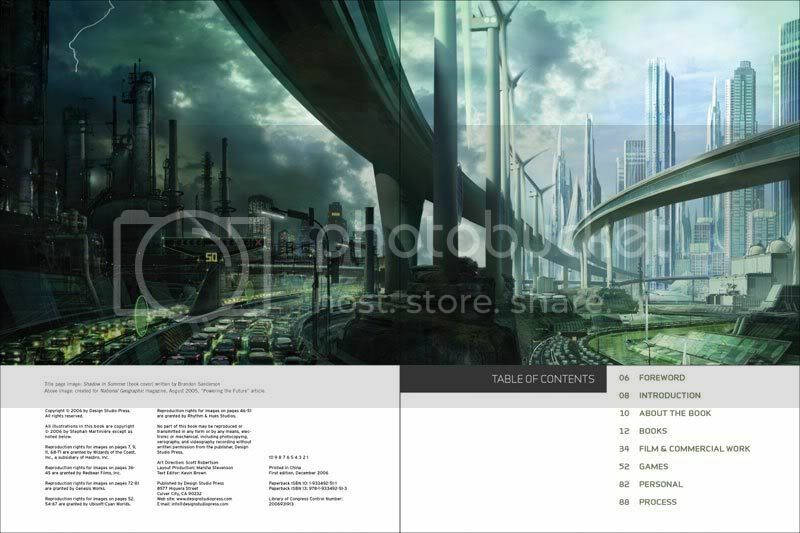 You can see a bunch of sample pages at Design Studio Press. I am happy to announce that a second Spectrum exhibition will be held at the Museum of American Illustration at the Society of Illustrators in September 2009. That may seem like a long way off but, trust me, I'm already shaking in my Berkenstocks. The exhibit will include selected works from Spectrums 12 through 15, representing each of it's categories -- Advertising, Book, Editorial, Institutional, Dimensional, Uncommissioned, and the newly added Concept Art. We held the first Spectrum exhibition a year ago September. 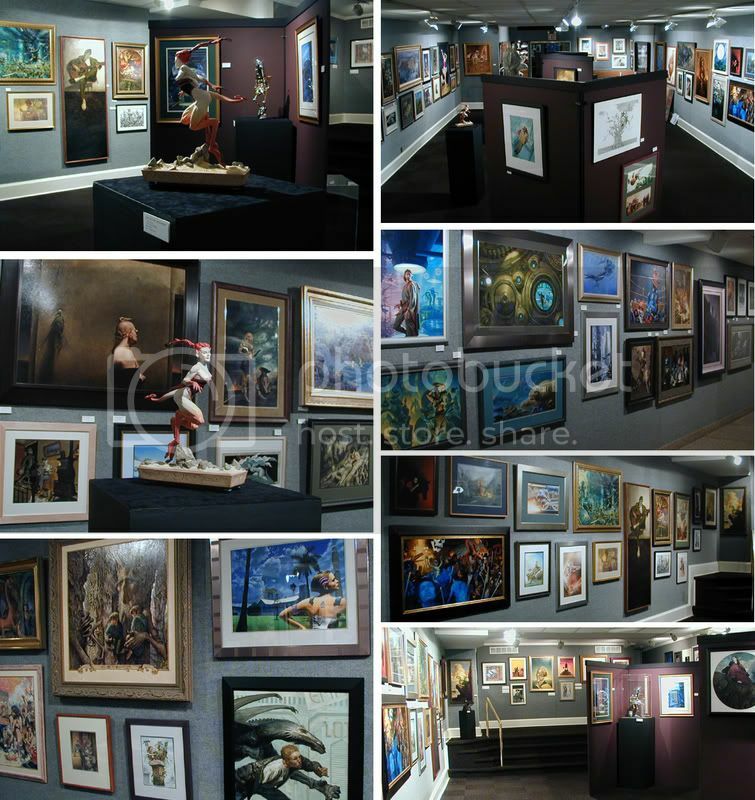 It was curated by Cathy and Arnie Fenner, Greg Manchess, and myself. It featured 190 works selected from Spectrums 1 through 11 covering 155 artists. The opening had over 300 attendees, including almost all of the exhibiting artists, and lasted late into the night. Everyone said that they were having the time of their lives -- extremely gratifying after two years of work putting it together, bit by bit. Unfortunately, while playing host I spent the entire night saying hello to everyone and not getting to actually talk to anyone. 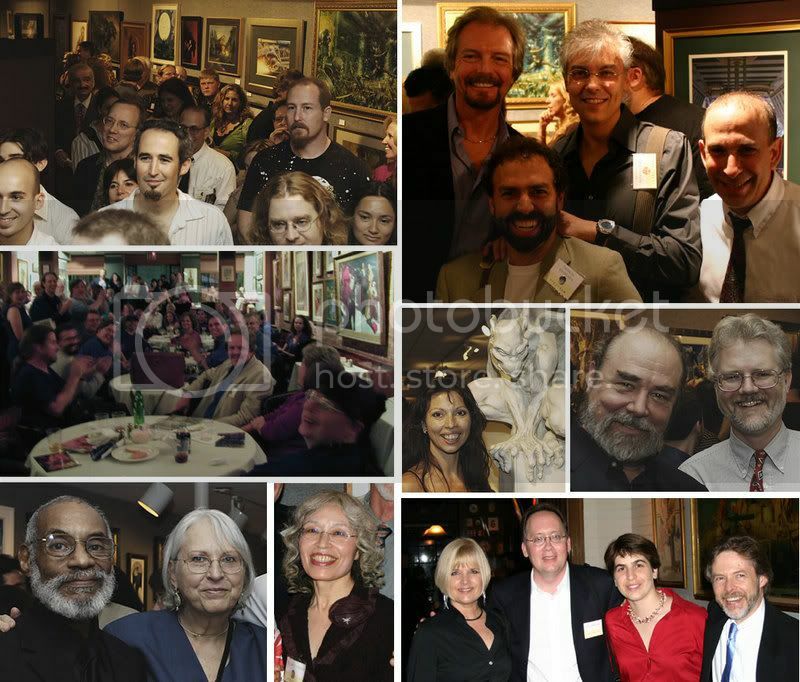 Too bad, 'cause a lot of really cool people were there -- J.J. Palencar, Robert McGinnis, Kinuko Craft, Raymond Swanland, James Gurney, Thomas Blackshear, Leo and Diane Dillon(! ), Thomas Kuebler, Tim Holter Bruckner, Justin Sweet, Bob Eggleton, Charles Vess, Brom, Scott Gustafson, Stephan Martiniere, and so many others I regret not mentioning by name. Quite a number of collectors, editors, and art directors were also in attendance. The exhibition was very well attended throughout it's run . Again, very gratifying. I was hanging around the place quite a bit, as you can imagine, and I often ran into groups having made the trek from various far off states. I was even more touched that people who had little or no connection to the genre said it was one of the best shows they had seen. I've said it everywhere I could but it's worth repeating: It would not have happened without co-curators and tireless collaborators Cathy and Arnie Fenner and Greg Manchess, and for a tremendous amount of help from Arkady Roytman, Bridget McGovern, Dan Dos Santos, and Donato Giancola. And, of course, it really would not have happened without the mountains of hard work that Cathy and Arnie put into Spectrum each and every year. It was loads of work, but it was also loads of fun , so....September, 2009, we'll do it all again! FURTHER READING: Here is an interview that Sequential Tart did with me about the show. Spectrum's site has a quick article and more pictures here. TOP: Banner. MIDDLE: A few views of the exhibition. BOTTOM, LEFT SIDE: Crowds in the exhibition. Crowds at the after party in the dinning hall. Leo and Diane Dillon. Kinuko Craft. 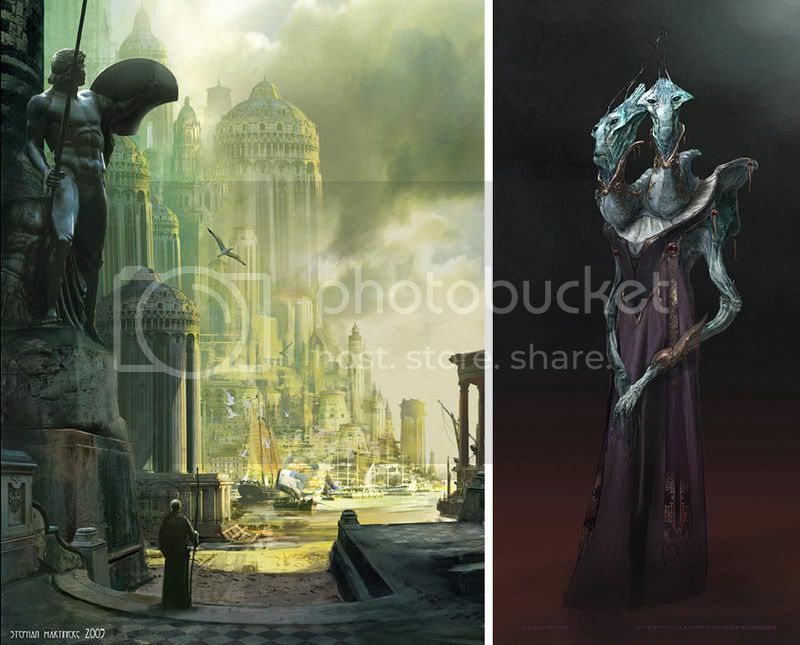 BOTTOM, RIGHT SIDE: Michael Whelan, Stephan Martinere, Donato Giancola, Joe De Vito. Sandra Lyra. Michael Kaluta and Scott Gustafson. Cathy & Arnie Fenner, me, Greg Manchess. I went to the opening of the Society's Third Biennale Dimensional Salon last night. I always look forward to this show -- it makes you want to run home and play!....Until you realize how hard it is. A bunch of years back I saw this show and promptly hired Red Nose Studio to do our Borribles trilogy. It's still some of my favorite cover art. The show is the brain child of Liz Lomax. I know how hard it is to start a show from the ground up so three cheers to Liz for keeping this show going. It just keeps looking better each time. Red Nose took the gold medal this year. Congrats! I don't think he can walk into the Society without getting a medal thrown at him...but, you know, he really is that good. Melissa Ferreira had two great pieces in. 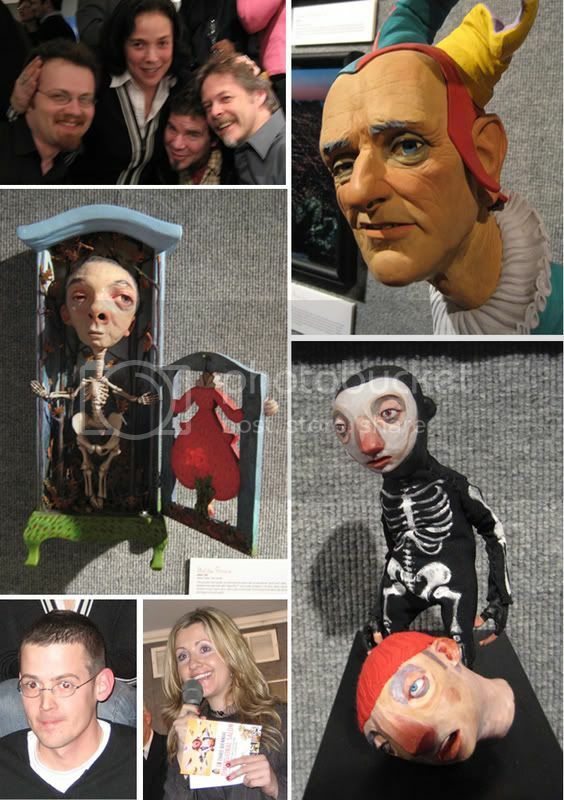 Tim Holter Bruckner, whose work I always look forward to seeing in Spectrum, had three sculptures in the show, all of them very cool -- especially the jack-in-the-box self portrait. Peter de Seve had a sculpt from Ice Age 2. I saw a lot of great work from people that I didn't know of, but I'm excited to look up. There is also a nice catalog that goes with the show explaining how the pieces are created. My only complaint is that neither the wall credits nor the catalog tell you who the client was or how the works were used. LEFT ROW: Melissa Ferreira with Arkady Roytman, Jon Foster, and Greg Manchess. Ferreira's work. 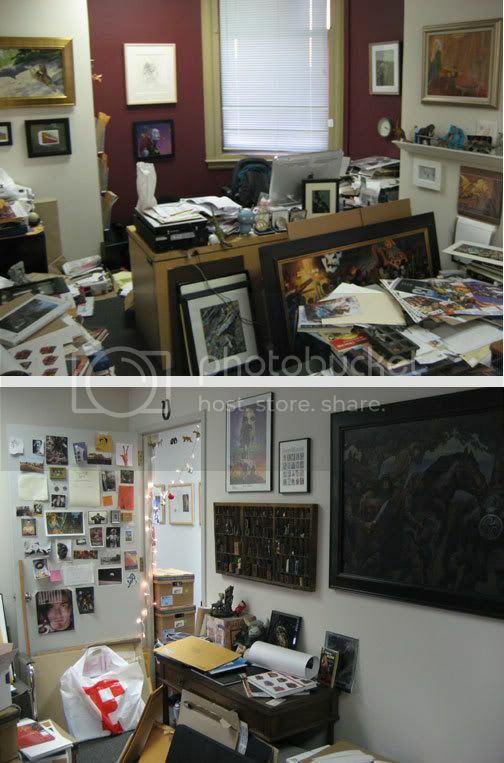 Red Nose Studio, aka Chris Sickels. Liz Lomax. RIGHT ROW: Tim Holter Bruckner's work. Red Nose's work. BOTTOM: More Red Nose. A huge congrats, and lots and lots of hugs, to Christina and Dan Dos Santos on the birth of their first born, Uno Dos Santos! (Which, I suppose, makes them Tres Santos.) Fantastic, guys! UPDATE: Dan says, " Everyone, call your mom and tell her how thankful you are. Moms rock!" Hey Mom, you do rock! I seriously wish I could go see this. Unfortunately it will be tough to get up there, with the holidays coming up. If anyone here gets to see it, let us know how it is. I was first introduced to Hubert Rogers when Tor published reprints of Slan and Null-A, and then I was reintroduced to him during a slide lecture by Vincent di Fate. (Or was it the other way around?) I enjoyed his strong, simple compositions, restrained pallet, and relative naturalism. A quick web search will bring up a lot of examples of his work...just be prepared for a very pleasant time-sink. 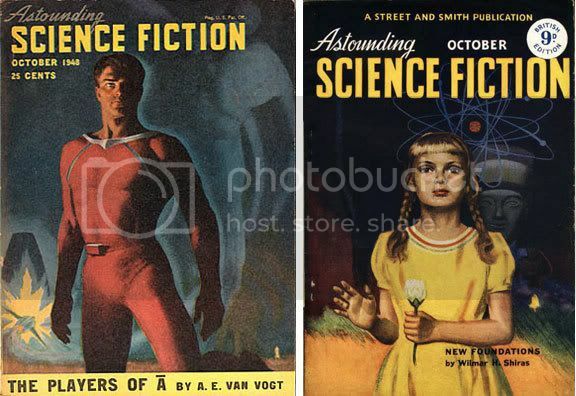 "Hubert Rogers was one of the best figure painters to work in the pulp field, and certainly one of the two or three finest artists to specialize in science fiction in the 1940s and 1950s." VINCENT DI FATE, from Infinite Worlds. Neil Gaiman has announced an "evening of conversation" with Dave McKean. For those of us not in Minneapolis, the event will be webcaste and archived at: channel.walkerart.org. 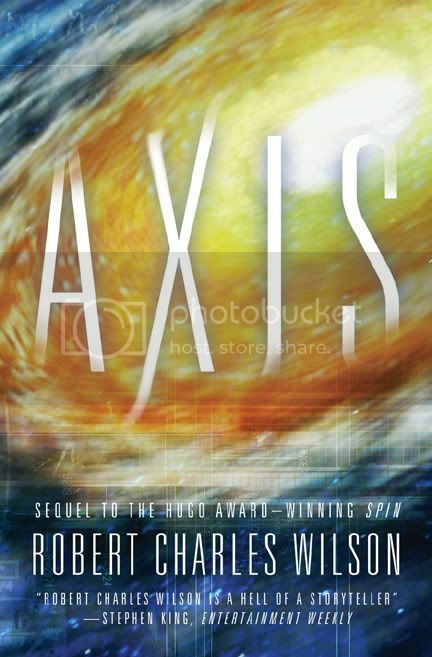 A reader emailed me to ask what the Axis cover looks like. As it happens, it just came back from the printer few days ago and it looks super cool on a foil paper stock. We printed a fair amount of white underneath the colors so that the final effect is a satiny sheen, rather than an overly reflective "wrapping paper" effect. The galaxy was created by Dave Seeley. The design by Drive Communications. Dave has done numerous covers for us, most notably the L. E. Modesitt science fiction books. Drive has created countless covers for us, on both the Tor and Forge sides, as well as our Starscape logo. Drive also designed the great coffee-table books, Science Fiction/Fantasy/Horror of the 20th Century for Collectors Press. Scott M. Fischer's excellent understanding of the human figure, combined with his bold sense of color and design, has made him the perfect choice for a broad range of genres and audiences. 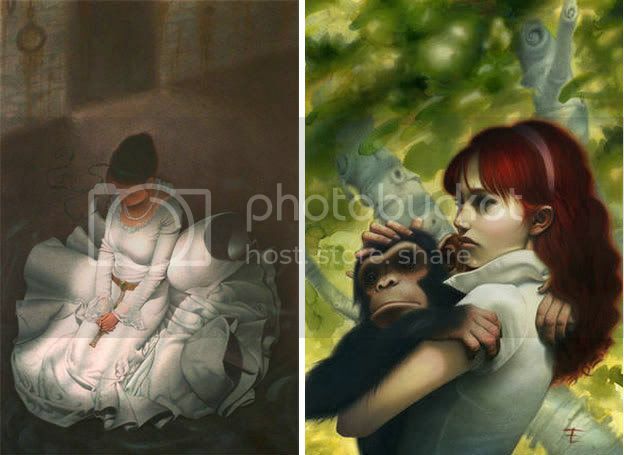 Scott’s work can be seen on adult and young adult book covers from every major publisher, role playing games, and Magic cards. 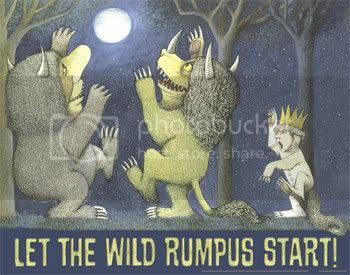 Currently Scott is writing and illustrating his own picture book for Simon & Schuster, to be published in 2007. Man-o-man, any of the great Klimpts! Do you remember the moment you knew you wanted to be an artist? 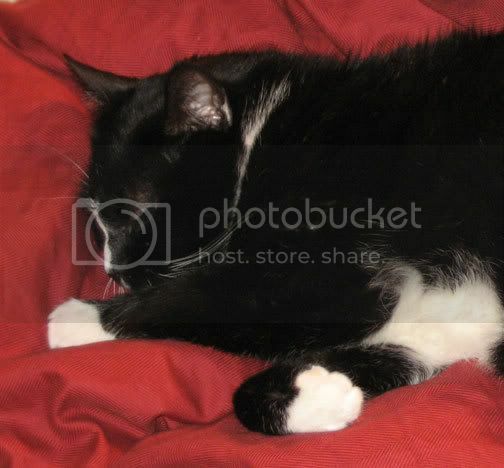 Heh, my mom jokes that I came out of the womb with a paintbrush in my hand, Yowch! But the first time I announced it to the world was in fourth grade. I wrote a paragraph saying that what I wanted to be when I grew up was the artist that did all the art for the Dungeons and Dragons game. It depends on how much freedom I have! Ideally, I love when a synergy gets created between the text and I, and I can get in the zone! Illustrating Peter Pan in Scarlet! Talk about putting me on the map! 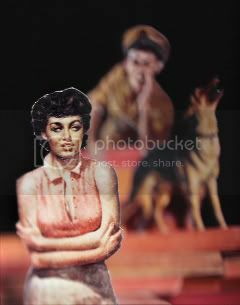 A cover for a Charles de Lint novel -- sooo fun! Book eight of The Secrets of Dripping Fang -- love that series! My second kids book, Mmmm Broccoli! And a Shell Silverstein-ish book of animal poetry, illustrated in the uber expensive medium of disposable ball point pens! Advice to a young illustrator? It takes years to amass technical ability, and that is important, but you will see your greatest improvement not with a new technique, but when you actually see things differently with your eyes. It is about the forest baby, not the trees. How do you balance family and work? That's always a tough one. If you are fortunate enough to be able to work in a studio at your home, the fam always knows you are there when needed. And spending lunch and a coffee break with your wife and kids every day is way cooler than a dad who has to be gone at the office 12 hours a day. We make out own schedule -- if I take an hour in the afternoon to go to the park, I can make it up late that night! And there are a lot of late nights.